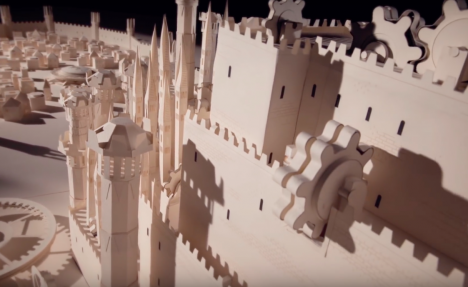 A snippet of the imaginative and ever-changing opening sequence of HBO’s Game of Thrones series is recreated in stop-motion using over 7,600 paper cutouts made with Moleskine notebooks in this 40-second video. 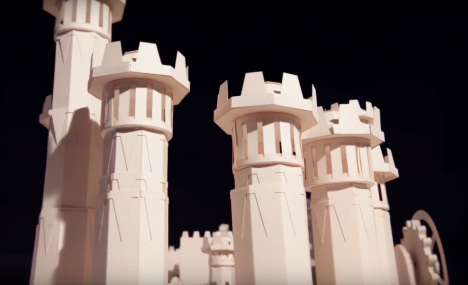 Made by Milan-based animation studio Dadomani to promote the brand’s new Game of Thrones notebooks, the moving models mimic the computer animation seen on the show, wherein three-dimensional structures emerge from the surface of a map and spring to life. 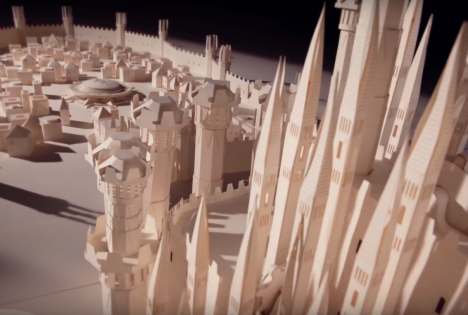 Opening with a view of the sigil of House Baratheon, the video sweeps through King’s Landing as paper gears turn and spires begin to retract. 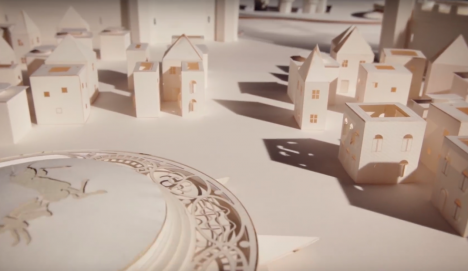 The tiny paper houses disappear as the stag-topped sigil spins, and the camera pans out to a classic Tolkien-style map of Westeros before the scene splits into four pieces. 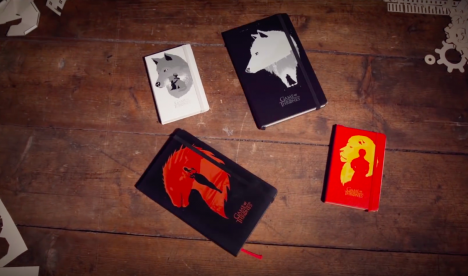 These four components are revealed to be the individual notebooks in Moleskin’s Game of Thrones series, each covered with the dire wolves of the Starks, the Targaryen dragon and the Lannister lion. 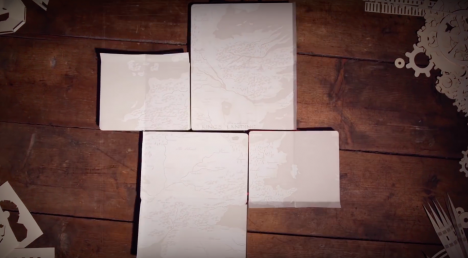 A fifth notebook, the collector’s edition only available in Moleskin stores, features an image of the Iron Throne. The silkscreened covers were designed by emerging artist Levente Szabó, and each notebook retails for $19.95 – $25.95. 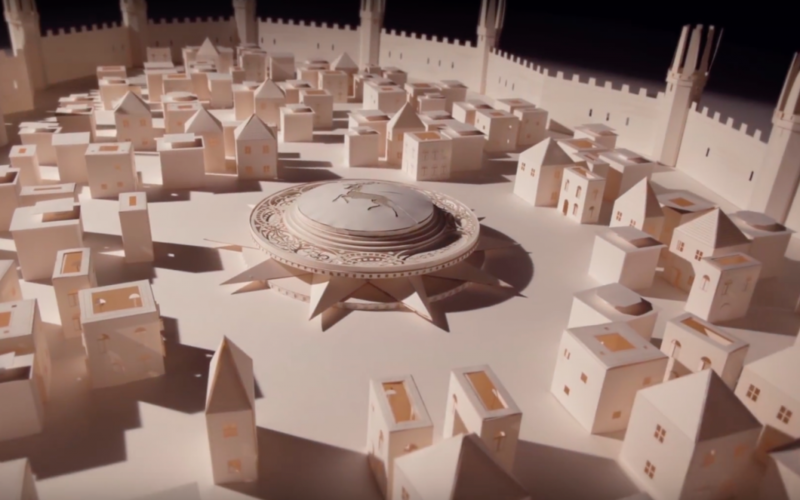 The designers of the original animation took inspiration from Leonardo da Vinci’s machines to achieve an effect appropriate for the fantasy series, which is set in a fictional country in a time period recalling the real-world Middle Ages. 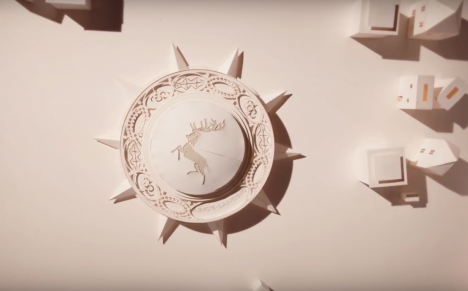 The cog-filled engines beneath the surface of the map that power all of the movements above represent the secret machinations of the series’ main families, the Houses of Lannister, Baratheon and Stark, along with all of their allies and enemies. 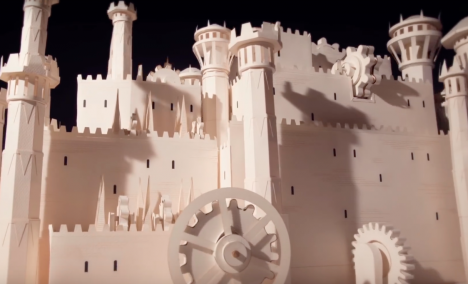 Check out how the paper version was created in the video above.